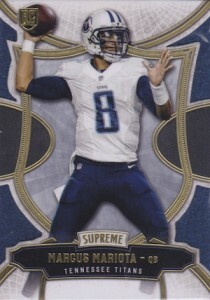 Short and sweet, 2015 Topps Supreme Football continues its tradition of one-pack boxes. The hobby-only product promises one low-numbered hit per box. 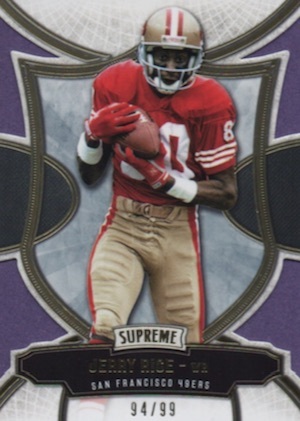 Again showcasing a quality design, the base set in Supreme Football highlights the top options among veterans, rookies and retired players. A variety of parallels add in rarity with Copper (#'d), Violet (#/99), Gold (#/50), Green (#/25), Red (1/1) and Printing Plates (1/1). 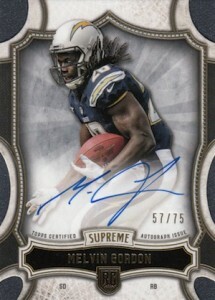 Autographs take several forms in 2015 Topps Supreme Football. Supreme Autographed Rookies pay homage to the top 2015 NFL rookies with varying print runs and offer Gold (#'d), Green (#/25), Red (1/1) and Printing Plates (1/1) parallels. Featuring up to 30 players, Autographed Retired and Veteran Stars celebrate past and present with print runs of 99 or less. Again, Gold (#'d), Green (#/25), Red (1/1) and Printing Plates (1/1) parallels can be found. Signed booklets cards add another wrinkle with inscriptions alongside a sticker autograph. Autographed QB Playbook Books (#/5) include a favorite play that is hand-drawn by the quarterback in question. Inscription Autograph Books (#'d) include a hand-signed inscription in silver ink. Averaging one per case overall, several multi-player autographs show up in the hit-centered release. Up to 50 Dual Autographs (#'d), ten Quad Autographs (#/5) and 20 Dual Autographed Patch Books (#'d) are available in both base and Red (1/1) parallels. 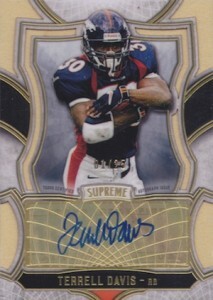 Taking things up another level, 2015 Topps Supreme Football also has several autographed relics. Supreme Autographed Patches (#'d) include patch pieces and sticker autographs. Parallels include Gold (#/25), Green (#/10) and Red (1/1). Supreme Autographed Quad Relics (#'d) combine four relic pieces along with a sticker signature. 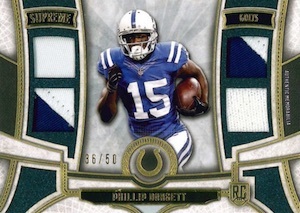 Premium options are available with Gold Patch (#/10), Green Patch (#/5) and Red Patch (1/1). Highlighting oversized jersey pieces, Supreme Autographed Jumbo Patch Relics (#'d) include Green Patch (#/5) and Red Patch (1/1) parallels. Supreme Autographed Team Logo Patch Books offer one-of-one inserts. 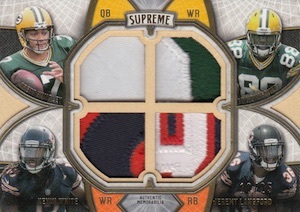 Lastly, a few different relic complete the 2015 Topps Supreme Football set. Base Relics include current stars, new rookies and former greats. Rookie Quad Patches (#'d) concentrate on the incoming class with up to 40 cards. There are also Gold (#/25), Green (#/10) and Red (1/1) parallels. Veteran Quad Relics (#'d) feature up to 25 different cards with three jersey swatches and one patch piece. Platinum Patch (1/1) is the sole parallel. The remaining options include several one-of-one relic inserts with even-worn pieces. 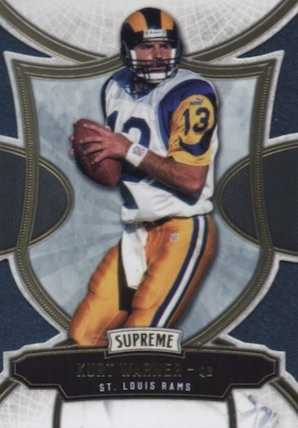 These quality memorabilia cards include Supreme Grip (player-worn gloves), Supreme Leather (player-handled football), Supreme Tag (player-worn jersey laundry tag), Supreme Spiral (player-handled football laces) and Supreme Logo Shield (player-worn jersey NFL Shield). EMMITT SMITH-2015 Topps Supreme GOLD (#21 25) AUTO AUTOGRAPH GEM-MINT? 31 cards. Serial Numbered #/75. 40 cards. Serial Numbered #/35 or less. 20 cards. Serial Numbered #/15. 38 cards. Serial Numbered #/5. 30 cards. Serial Numbered #/55 or less. 30 cards. Serial Numbered #/15 or less. 35 subjects. Serial numbered 1/1. Good: Unique primary design, mostly on-card rookie autographs, impressive booklet cards, solid mix of retired/current stars and rookies in checklist. Bad: Many sticker autographs, single box hit can be a relic, high price tag for just one hit and three base/parallel cards. 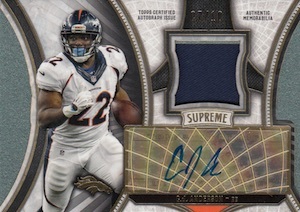 The Bottom Line: Among the one-pack products, 2015 Supreme is a standout based on the quality of the cards and the strength of the checklist. Still, given the price and box output, it is very much a gamble. The potential makes it much more intriguing but the possibility of a jersey relic as the only hit looms heavily. 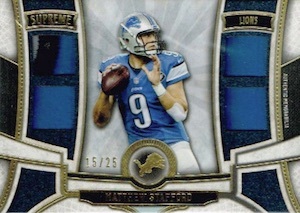 The main design in 2015 Topps Supreme Football is best described as a multi-layer, die-cut mash-up with foil accents and a colored background. I happen to enjoy it and think it offers an elegance that is less common these days at the mid-level price point. Unless you hit something huge, the actual design options will not waver much and I only pulled one main design with the four cards in my box. Variety is nice but hard to expect from four cards. While very rare, the booklets definitely catch the eye in a good way despite the sticker autographs. Mixing top 2015 rookies with current stars and retired greats, the autograph checklist is varied and fairly deep. Most impressive are the Hall of Fame names like Jerry Rice, Barry Sanders, and Brett Favre to go along with many notable pairings like Aaron Rodgers and Peyton Manning and key rookies that include Winston, Cooper, Gurley and Mariota. It is worth noting that while most Rookie Autographs are on-card, Amari Cooper and Todd Gurley both feature sticker autographs. Helping value and interest is the fact that all the hit cards showcase lower print runs, even accounting for the parallels. 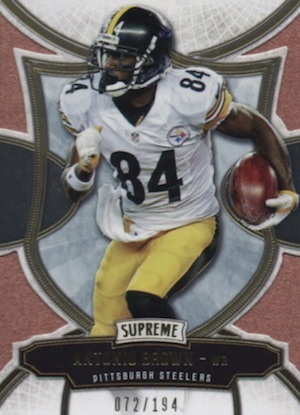 Value is the main issue for 2015 Topps Supreme Football. At $80-100 per box, you need a solid hit to justify the cost. That would be difficult enough with only autographs to pull but becomes even more of a gamble when you throw in the possibility of jersey relics, many of which that sell for just a few dollars. 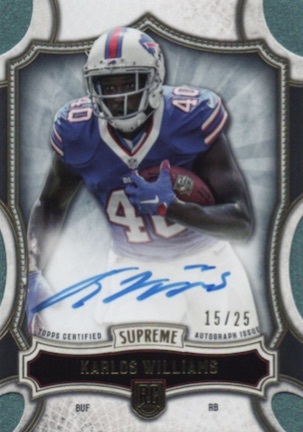 Obviously a moot point now, but Supreme Football would benefit greatly by adopting the baseball format of two autographs per box and a slightly lower price point. The price is simply too high with the current format. 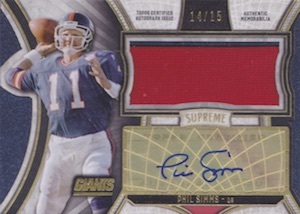 My box-opening experience with 2015 Topps Supreme Football was quite enjoyable. I liked the quality of the base cards and appreciated the effort put into the design. On top of that, the one hit I pulled was a low-numbered, on-card autograph for a decent rookie. Of course, I was left wanting more, but that usually is the case for these one-pack products. See it live on eBay. Bid early and often. Superb design and great quality. Overall this is an excellent product with lots of variation, decent pulls and a good mix of current & retired players. Would highly recommend this product- good value for money. 2015 Topps Supreme Football Hobby Box - Factory Sealed!